The PIN code, made up of 4 numbers, is the access code for your SIM card, and so for the Mobistar network. PIN stands for Personal Identification Number. You will need to enter this code every time you turn on your mobile. As your PIN code is secret, it will appear on your mobile screen in the form of little stars or other symbols. The PUK code (Personal Unblocking Key) is made up of 8 numbers and is used to unblock your SIM card when you have entered the wrong PIN number 3 times. You will find your PIN code on the card that was attached to your SIM card. This card was in your welcome pack (= Welcome Box). 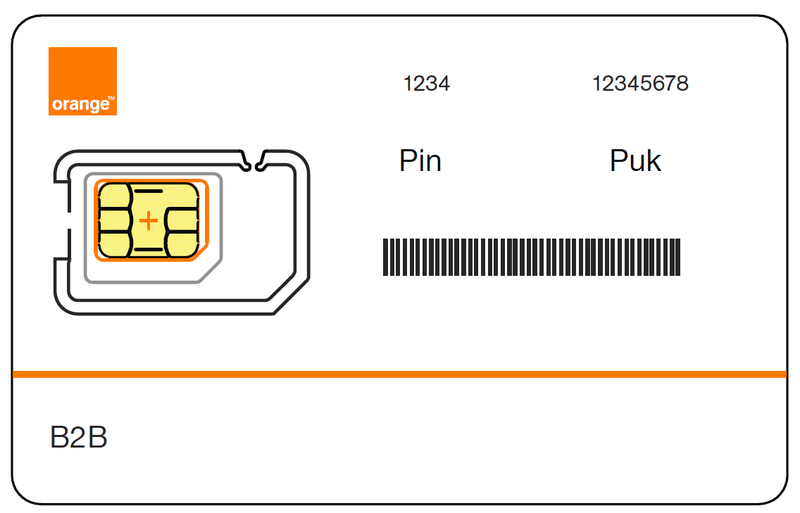 The PUK code can also be found on the silver part of your SIM card. We recommend securing your mobile with a PIN code, and changing it to a personal code. Some devices let you change the PIN code in the phone menu. If this option is not shown, you can change your PIN code manually, by taking the following steps. Enter the following combination into your mobile: ** 04*OLD PIN*NEW PIN*NEW PIN# and then press the Call button. Would you prefer not to have to enter your PIN code when you turn on your mobile? All you need to do is deactivate this protection. However, you will be exposing yourself to an increased risk of someone else using your SIM card. You are running an even greater risk if your mobile is stolen, because it means that anyone can use it. I can't remember my PIN/PUK code. When you have forgotten your PIN code, it is best to enter the wrong PIN code 3 times. Then the device will ask for your PUK code, and you will be able to choose a new PIN code. N.B. If you enter the wrong PUK code 10 times in total over the lifespan of the SIM card, it will stop working and will have to be replaced. Via your Customer Zone: as the person responsible for the contract, you have access to the PUK codes for all your employees in the fleet management menu.